· COAI calls for a stable long – term, predictable policy environment which facilitates affordability, growth, innovation and investments. May 17, 2017: New Delhi: On the occasion of the World Telecommunication and Information Society Day (WTISD) - 2017, experts from the industry, government and academicians, today came together to discuss technology and policy developments for addressing solutions and promoting sustainable practices through innovation and application of technology. The goal of the high level roundtable was to have fruitful discussions on how technological advancements in Indiaare contributing towards the 17 UN SDGs. There was a focus on drivers of innovation, accomplishments, future opportunities, key barriers, and needs, while elaborating the telecom success story in India. Calling for a cohesive ecosystem and breaking down of silos and a call for consistent closer collaboration between five ministries DoT, MoC, MeitY, MHRD, I&B and Skill Development. 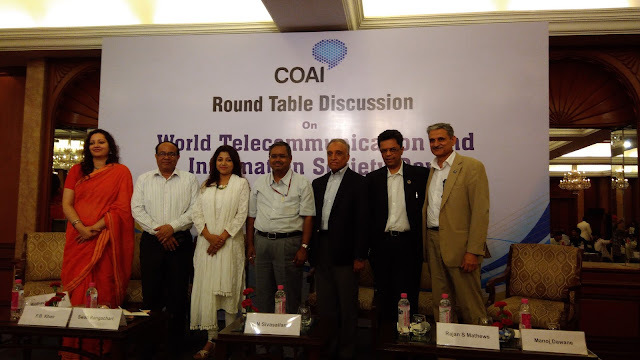 COAI emphasised on the need for digital literacy and capacity building and creation of local language content for actualising the true potential of Digital India. Over INR 9,27,000 crores have been invested so far by TSPs in building world class Telecom Infrastructure. About 3.51 lakh BTSs were added and subscribers have crossed the mark of 1 billion. Total internet subscribers in India are 261.31 million as per TRAI data. The industry is proud to have deepened democracy, voice to the margins and underrepresented communities and stakeholder groups, articulated dissent, spoken truth to power, advocated for a better policy and regulatory environment and worked shoulder to shoulder with the government through its most ambitious programs of digital capacity building, removing corruption, moving India towards a cashless economy. Sustainability & Corp Responsibility - Ericsson India, amongst others, the high-level roundtable also discussed various opportunities and challenges faced by the sector, which truly has emerged as one of the biggest growth driver of the nation and contributor to the exchequer. Highlighting the role played by the telecom sector in taking India to the world, Mr. Mathews added, “On the occasion of World Telecommunication and Information Society Day today, COAI proudly announces the theme of Indian telecom industry for the year as “Telecom & Connectivity as tools for Accelerating Human Development in India”. By 2020, the contribution of mobile industry to the country’s GDP will increase to 8.2 per cent from the current 6.5 per cent. It is also expected to generate four million direct and indirect jobs over the next five years. Globally, we will also have between 26 billion and 50 billion Internet-connected devices by 2020.” he added. Lauding the government’s decision for setting up an inter-ministerial committee to look into the financial health of the sector, COAI urged the government to take concrete steps that will improve the situation. Mr. Mathews also underlined the fact that Reserve Bank of India (RBI) recently issued advisory to all the banks to re-assess the debt bearing capability of the telecom sector. “The recent results announced by the telecom companies are not an indication of a healthy growth of the sector. Immediate policy-level interventions are required to uplift the financial health of the sector and to ensure that we move in the right direction of pursuing our national goals,” Mr. Mathews added. Meanwhile, the industry representatives expressed their happiness and pledged their continued support for the role telecom and allied industry has played in achieving the flagship initiatives of the government such as Digital India, Cashless India, Skill India and Start Up India. “There is no better feeling than being able to partner in national development goals and contribute to nation building. The telecom industry promises that it will leave no stone unturned for ensuring the success of these flagship programs” said Mr. Mathews. The panel was also enriched through the participation of notable academia and public intellectuals like Prof. Madhav Das Nalapat and Prof. Farhat Basir Khan. Prof. Nalapat highlighted the role played by ICTs in deepening democracy while Prof. Farhat Basir Khan who’s also the founder faculty member of AJKMCRC , Jamia Millia Islamia highlighted the Khan Charter outlining his vision for an inclusive city through SDG’s and ICT’s. The panel closed with an interactive session with all the stakeholders present. At the end, COAI also announced the schedule of Indian Mobile Congress to be held in September 2017. “Indian Mobile Congress will project the Indian telecom industry at par with the world and will fill a big vacuum between the existing events like World Mobile Congress in Barcelonaand Shanghai,” Mr. Mathews said.